With the modifications it is possible to bring the engine’s power to well over 200 horsepower. But there’s more where that came from, if you’re looking for more performance. By getting deeper into the engine, we can bring the car up to as much as 300 horsepower, and add more torque in the rpm mid-range, adding to the car’s performance off the line, when overtaking other cars, and getting out of the corners. Horsepower-enhancing aftermarket parts include a plasma booster for spark plug performance, spark plug wires to take advantage of the stronger spark, an upgraded throttle body, a hotter cam shaft, and an improved cylinder head, as well as silicone hoses to improve reliability. The intensity of the spark that is delivered to the cylinder by the spark determines how efficiently the air/fuel mixture in the cylinder will be ignited. The efficiency of the ignition in turn affects the engine’s power output, mileage, and smoothness of operation. A simple “black box” can be added to the ignition system to achieve these benefits. Called a Plasma Booster, it is a power amplifier that increases the power of the primary and secondary spark circuit by nearly 100 percent to deliver a much “hotter” (more powerful) spark to the cylinder. A more powerful spark will ignite the air/fuel mixture more easily, and cause the mixture to burn more quickly. The result is more power from the fuel, more efficient use of fuel, and more consistent power from each individual firing for smoother engine operation. Individual measurements before and after the addition of the plasma booster indicate an additional four horsepower from the engine, and ten percent better fuel economy. The Plasma Booster costs about $270, and can be added to the engine in just a few minutes without any special tools. As a nice plus, it is certified for use in MINIs by the California Air Resources Board because of its benefits in reduced emissions and better fuel mileage. Interestingly, some high-tech spark plug wires can provide an alternative to the Plasma Booster to accomplish the same task of increasing the intensity of the spark produced by the spark plug and thus provide the same benefits. The Nology company makes a set of spark plug wires that each incorporate a capacitor and separate ground connection. With this addition, the spark plug wire itself stores up the energy of the spark until it reaches a high intensity level, then releases it in a shortened burst that provides a quick, clean ignition of the fuel/air mixture. The manufacturer claims an increase in spark intensity of over 300 percent, which measurably increases horsepower and mileage, and reduces emissions by providing more a complete burn of fuel. An added benefit is that the substitution of the high-tech spark plug wires is legal under California Air Resources Board regulations. The Nology spark plug wires sell for $199 for the set, and can be ordered in red, blue, yellow or black for that added eye appeal in the engine compartment. Even better, they can be installed without any special tools. As we discussed in an earlier chapter, performance of the supercharger on the MINI is enhanced by the presence of an intercooler. If the supercharger was used without an intercooler, as the engine heat increased intake air would be heated, as well. And as we know, hot air is thinner than cool air. The result would be that as the engine heated up, it would produce less horsepower than when it had first been started up. To solve this problem, the intercooler, which looks like a radiator, surrounds the air duct between the air intake box and the supercharger. Air coming in through the hood scoop blowing across this radiator helps cool the incoming air to make the supercharger work more efficiently. This type of design is called an “air to air” intercooler. However, the limited space available withiin the engine compartment imposes some design contraints that limit the performance or the intercooler. In particular, there is very little space underneath the intercooler, limiting air flow through the intercooler. To improve on this design, several suppliers have designed their own air-to-air intercoolers that can be substituted for the factory intercooler. These improved designs will improve the intercooler’s ability to cool intake air. They don’t actually increase horsepower, but they do reduce the loss of horsepower due to heat, so a MINI equipped with one of these devices will give better performance than a MINI equipped with the stock intercooler. Some other sources have taken one more step, and created a water misting system, which sprays water on the intercooler. These systems take advantage of the same principle of water evaporation that causes you to feel cool when you first come out of the water in the summer. These systems help the intercooler work more efficiently by taking advantage of the water evaporating off the intercooler’s radiator. However, at least one designer has taken a completely different approach to the problem. This company produces a “water-to-air” intercooler, which has shown significantly better performance not only when compared to the factory intercooler, but also when compared to aftermarket air-to-air intercoolers. When discussing basic engine operations, we noted that the amount of air and fuel that can be provided to the cylinders is a major factor in determining how much power the engine will produce. Changing the cold air intake box and filter increases the potential to provide more air into the engine, but the other side of the equation is how much fuel is added to the air, and how fast the fuel-air mixture can be fed into the cylinders. 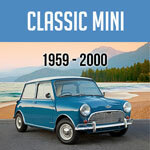 The MINI uses a “throttle body” to control the amount of air flowing into the engine. When you push the gas pedal, the electronic throttle connection causes a butterfly valve, sometimes called a “throttle plate” to open in the throttle body, increasing the flow of air into the engine. Several types of upgraded throttle bodies are available for the MINI that have openings that are larger than the stock 58mm opening, so that more air can flow into the engine across the full range of throttle openings. With increased air flow comes increased horsepower and torque. The increased air flow also gives better throttle response, improving driveability across the rpm range. The better quality throttle body upgrades incorporate precision machining of the nozzle, which also helps increase air flow. By angle machining the throttle plate, the better quality products also prevent air from flowing into the engine when the throttle is closed, providing more precise response when you lift off the throttle. One high-quality upgraded throttle body sells for about $460 plus a core charge of $250 that is refunded when the original throttle body is shipped back to the supplier. Replacement of the throttle body is a straightforward installation for an experienced shop. Getting to Know Your MINI Cooper , your New Best Friend. Friends should be fun and the MINI Cooper is for sure first in class. Track Day Driving Techniques- With some practice on the track, or on the autocross course, or preferably both, and some focused attention to your driving techniques while on the road, you should be getting a feeling for driving a high-performance automobile well. Even if there aren’t any opportunities for track days or autocrossing in your local area, or you just don’t feel comfortable putting your new MINI through that kind of ordeal, touring can be a great way to enjoy time with friends, see the scenery and sights in your region, and have some fun with your MINI. Buying Your New MINI Inspired by the enormously popular Austin Minis and Morris Mini Minors produced in the millions from 1959 to 1999, the new MINI by BMW combines the efficient package and sporting heritage of its predecessors with thoroughly modern technology, creating an automobile that is both fun and practical to own. What Kind of Motoring Do You Want to Do? If you’re considering buying a MINI, you’ve probably already gone to the MINI website, www.MINIUSA.com, to see for yourself what all the hub-bub is about. The website provides a neat way to look at all the options and do some thinking long before you have to sit across the table from a dealer representative. Before you jump in your current transportation module and head out to your MINI dealer, let’s take the time to go over a few basic driving tips that you’ll be able to use when you buy your new MINI. You’ve probably already been impressed by how good the MINI is at what it does. It’s quick off the mark, fast on the highway, and can zip around corners at an enviable clip with almost no body sway or looseness. Now that we’ve spent some time explaining where engine performance comes from, and how to get more out of your MINI Cooper S or Cooper, we need to inject a note of reality. Taking it to the Track In many of the street-driving schools conducted at regular race tracks, the curriculum often includes the opportunity to drive some “hot laps” on the track. 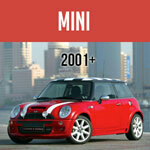 Serious MINIs for Touring, Track and Autocross. What Next? Once again we’re back to trade-offs. For the average driver, with average passengers, the ability of the car to absorb bumps without rattling the dentures of gran’pa in the back seat is at least as important as how fast the car will get around corners.